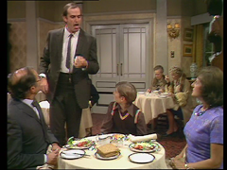 Fawlty Towers are holding a Gourmet food Night and Sybil agrees for once this may become a regular night to invite the local upper class clientele to dinner. Their friend Andre owns the local restaurant and has prepared a menu for them and lent them his top chef Kurt to prepare the meals. Things are going well In the lead up to the Gourmet Night. 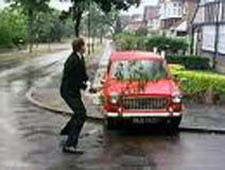 Except for Basil arguing with Sybil and Manuel reporting of Kurt's unwanted physical advances on him. The first guests, Colonel and Mrs. Hall arrive, the Colonel has a large facial twitch which Basil finds difficult to ignore. Sybil tries to keep correcting Basil's social f`aux pas but it proves impossible for Basil to introduce Mr. & Mrs. Twichen to the face twitching Colonel. Polly brings bad news that Kurt the chef has got drunk because Manuel won't return his affection and can no longer do the cooking, in fact Kurt passes out. 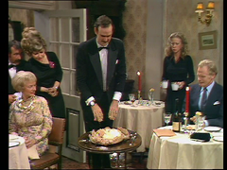 With no chef and the panic on, Basil, Sybil and Polly band together to prepare the entree's while Basil calls Andre, who prepares a duck as a menu replacement but the guests all accept the alternative main course. Unfortunately the entree's are ill prepared and offend both the Hall's and the Twitchen's, Manuel's incompetent service doesn't help matters. 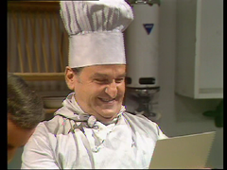 Basil arrives back with the duck but a collision with Manuel in the kitchen destroys this duck and Basil has to drive back for another. Manuel, Polly and Sybil stall for time with somewhat lame entertainment while Basil's car conks out. The guests patience is strained until Basil finally arrives back with another duck. Unfortunately Basil grabbed the wrong covered dish at Andre's restaurant and tries to offer the revealed trifle to the guests. 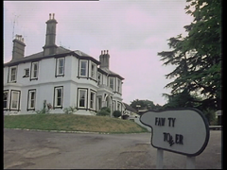 Gourmet Night doesn't end up going down too well with the locals but that's to be expected from one held at Fawlty Towers. Originally I didn;t think much of this episdoe but it's grown on me with age both mine and the series'. It is a nice change for once to see an episode where all the characters band together to meet the headlong crisis for the week rather than clash with each other and delve into a situation that focuses too much on Basil's neuroses. 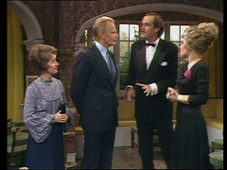 It starts off with Basil & Sybil's idea to hold a regular Gourmet night at the the hotel inviting the local dignities, well a retired army colonel and a Rotarian treasurer on this occasion as no one else could turn up. But this wasn't helped by Basil's ad stating "no riff raff" much to Sybil's indignation. The first get talked into the idea by Andre, their friend and head of their favourite local restaurant played with definire frenchness by Andre` Maranne. this guy has worked with Peter Sellers in the Pink Panther movies and Spike Milligan wonder how he felt at working with the top British comedians of the time? Basically it could have run smoothly if the chef Andre got to do the cooking that night didn't get drunk and collapse. Anyways it's a refreshing and appetizing episode where again everything goes wrong and for once it's not of Basil's making it's just circumstances that led to the night becoming a disaster. 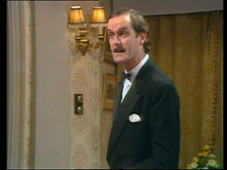 The cringe factor goes up in this one from Basil's constant faux pas, asking guests if there daughter's alright (when she's dead) or being unable to cope with a guest's facial tick. Manuel and Polly have their cringe worthy moments too providing awful spontaneous entertainment for the guests to buy Basil enough time to get to the restaurant for some substitute food.